For several years I taught a one-day workshop at my friend Donna’s exquisite restored prairie in Western, Wisconsin. The class focused on the natural history and ecology of the prairie and on the native, medicinal plants of the prairie. These beautiful, tough wildflowers were used by Native people and later by white doctors, healers and people who moved to this area. There’s nothing like standing among those tall, tall, sun loving beauties, with the butterflies floating around you and the birds calling. While the prairie may not have the dramatic majesty of the mountaintop or the ocean, the prairie powerfully stirs the soul. My friend sold her home and land last year. I miss visiting that lovely prairie and I’ll miss offering my prairie class. Yesterday while walking around St. Paul I found a little bit of Pleurisy Root in a slightly neglected prairie planting on some public land. This little plant got me thinking about the prairie and I decided to share with you some of the information from my prairie class: a plant profile of Pleurisy Root. Stay tuned; I have eight prairie plant profiles to share with you, including Gentian Root, Rattlesnake Master, Sweet Leaf, Anise Hyssop, Goldenrod, Baptisia and Echinacea, as well as information about the history and ecology of the prairie. 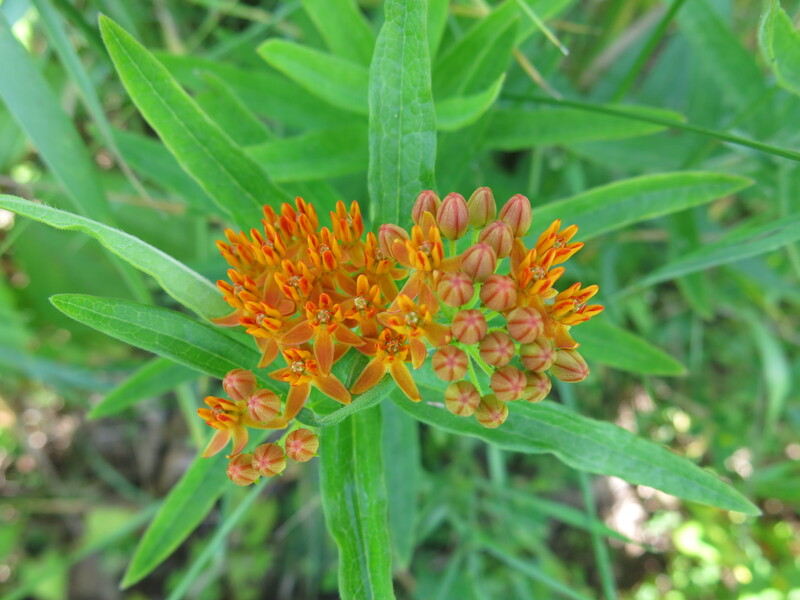 Asclepias tuberosa, called Butterfly Weed by wildflower enthusiasts and Pleurisy Root by herbalists. The Asclpias genus is large and includes about eighty species. There are fourteen species in Minnesota. You can read more about them here. However, only A. tuberosa has orange flowers; other members of the family have cream, white or various shades of pink. It’s not as tall as the common milkweed you see everywhere and the foliage has a more petite and delicate appearance. Pleurisy Root is a beautiful member of this family and as the name suggests, is loved by butterflies. It grows in sunny places and does well in sandy soil. While A. tuberosa is a native plant, due to prairie habitat destruction I usually find this plant not in the “wild” but in those semi-wild areas that have undergone a a prairie restoration or where prairie wildflowers have been intentionally planted. Pleurisy Root is considered a “to watch” herb by the United Plant Savers. I suggest herbalists who wish to use handmade Pleurisy Root tinctures should grow it in the garden or harvest it in restored and actively managed prairie. If you find it in a native plant community, consider yourself lucky and take a picture but don’t harvest. With that in mind, Pleurisy Root’s signature uses are for lung ailments and acute illness. According to Priest and Priest it is useful for “catarrhal complains from cold and damp, hard dry cough, bronchitis pleurisy, peritonitis, pneumonia, influenza, intercostal rheumatism, and other intercostal diseases.” I add whooping cough and croup to this list. Not all of these illnesses are treated by the contemporary herbalist, but many people want adjunctive herbal therapy even with antibiotics. The theme here is harsh cough and cough that causes pain in the chest and ribs. I often use Mullein for these kind of problems as well. Pleurisy Root has also been used historically for asthma, eczema, some digestive disturbances, like colic and gas. There is a marked moistening or fluid regulating quality to Pleurisy Root that works throughout the system. From Matthew Wood we learn a specific indication for Pleurisy Root is ” a full, stuffy, oppressed feeling the chest and a full pulse.” Additionally people who need Pleurisy Root have hot skin with flushing or redness. It is possible that the skin may have a harsh and dry appearance. Traditionally, Pleurisy Root was used during childhood illnesses. Pleurisy Root contains cardiactive glycosides. It is generally considered contraindicated in pregnancy for this reason. This may make Pleurisy Root contraindicated for those on certain types of medications for cardiovascular conditions. Always exercise caution when using moderate to large doses of herbs with individuals on medications for heart disease. Those of us practicing using an energetic model and administering microdoses or low-dose protocols may have less concerns. Journal of the American Herbalist Guild. Review of Pleurisy Root.